Coll. No. 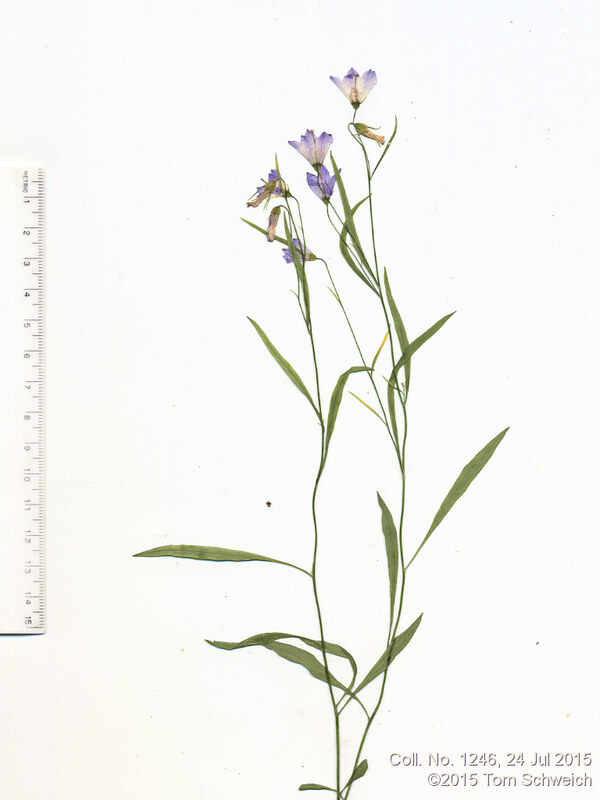 1246, 24 July 2015, characters observed: Perennial herb, to 40 cm. ; Leaves, basal, ?, cauline, alternate, ±lance-linear, 52 mm. × 2.5 mm. wide; Inflorescence, solitary and loose racemes; Pedicel, 9 mm. ; Calyx, tube 2.5 mm. + 5 lobes 2.5 mm. = 5.0 mm. ; Corolla, 13 mm, blue-purple; Capsule, nodding, 5.5 mm. × 4.5 mm. wide, opening by pores near the base. Field Notes: Coll. No. 1246, 24 Jul 2015. Other photos about Species or Campanulaceae Campanula rotundiflora.